Is there a way to make Brussel Sprouts taste good? 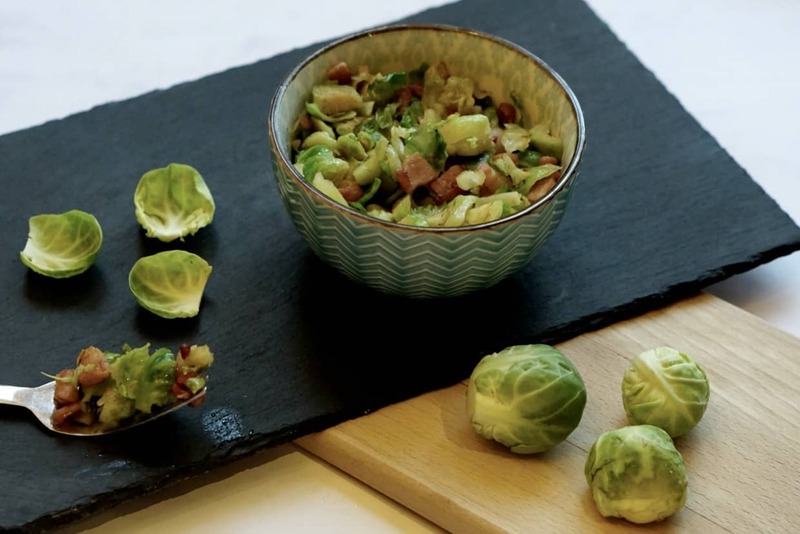 How to make sautéed brussel sprouts with bacon for roast dinner. However this amazing recipe for brussel sprouts with bacon or pancetta and butter was a real success. So how do you cook brussel Sprouts with bacon for roast dinner? And check out my post with the recipe for the best red cabbage for roast dinner. Woohoo its Sunday roast season! As much as I mourn the end of summer, I absolutely adore autumn. Crunchy leaves, buying new winter woollens. And of course Sunday afternoon walks to a country pub for a glass of wine whilst the perfect Sunday Roast is cooking away in the oven. 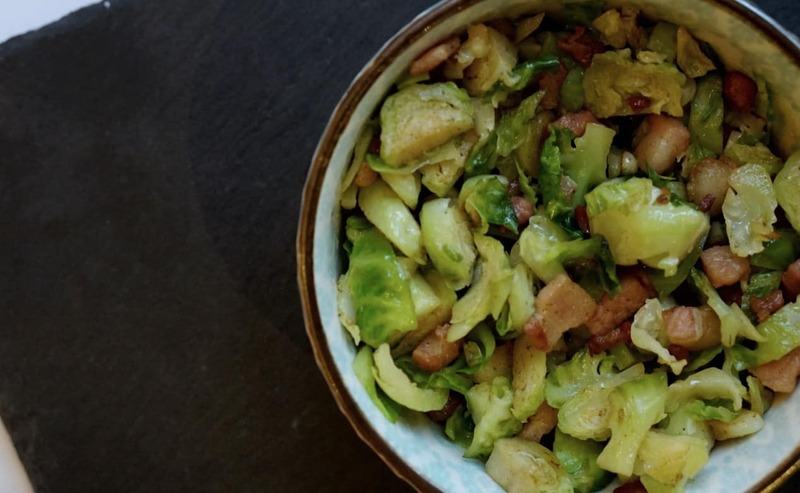 And this Brussel Sprouts with Bacon or Pancetta Recipe is a real winner for Sunday roasts. 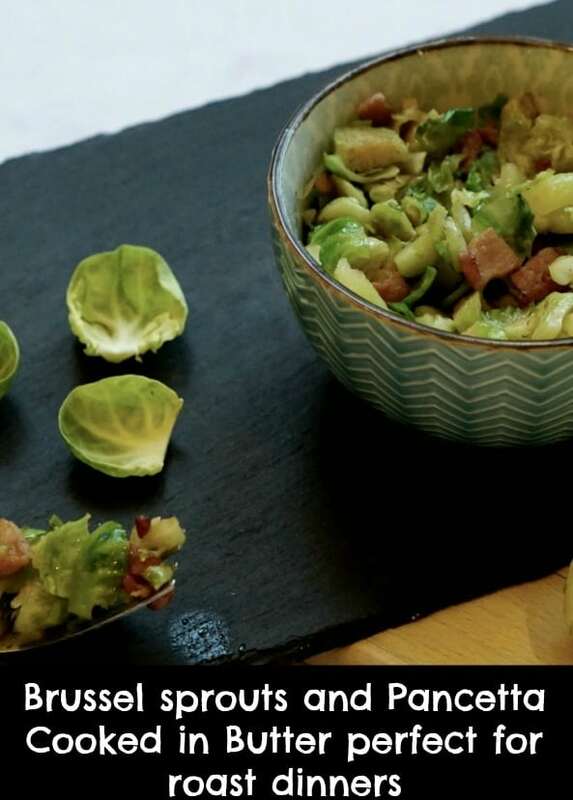 Brussel sprouts were always a bone of contention in the Christie household until we discovered this easy brussel sprout recipe. I suppose getting it right and having tasty sprouts is all about knowing how to cook brussel sprouts to make them taste good. You see I adore brussel sprouts, always have. I mean come on what’s not to love? Every week I would buy a mini bag, And Chris would cook me my own little portion to go with my roast. Then one day as Chris was watching Jamie Oliver (He loves a great cooking programme) And Jamie Oliver’s brussel sprout recipe is incredible. He was making pancetta and butter fried sprouts, so he decided to give it a go. More in an act of trying something new, as he really could not see how I could love sprouts so much. We like to make everything from scratch in our house, meaning roast dinners take a little morning prep. But home made means you know exactly what’s in it. Can control quantities you cook and know exactly what ingredients you are feeding your family. That is so important to us, and hopefully will educate them moving forward into adulthood. Chris also loves them and it is now an absolute essential to any Christie roast dinner. Taking the humble and in my opinion ever so tasty brussel sprout to a whole new level. You can also fry your brussesl sprouts with bacon it works just as well. Cook the pancetta in a hot frying pan until cooked (keep moving around the pan for the whole time) and then put to one side. Add the cooked pancetta and cook and cook for a further 2 minutes. Brussel sprouts cooked with bacon or pancetta and butter foam, the perfect addition to roast dinner.